course on human rights in schools run by the agency in the Gaza Strip. The UNRWA bid drew strong condemnations from the Hamas government, whose representatives accused the international agency of seeking to “brainwash” Palestinian children. Al-Minawi said that UNRWA proposed two years ago to include in its school curriculum the subject of human rights. UNRWA was hoping, he added, that the subject would be taught to children from Grades 7-9. According to the Hamas official, his government back then expressed reservations about some of the contents of the subject, prompting UNRWA to amend about 40% of the material. The Hamas protests forced UNRWA to suspend its plan to teach the subject of human rights in its schools. Some Palestinians criticized UNRWA for “succumbing” to threats, while others said they were aware that the international agency had no choice but to comply. In an attempt to calm Hamas, UNRWA denied that its school curriculum contravened Palestinian tradition and culture. A spokesman for UNRWA said that his agency consults with “all components of Palestinian society” about its human rights courses. 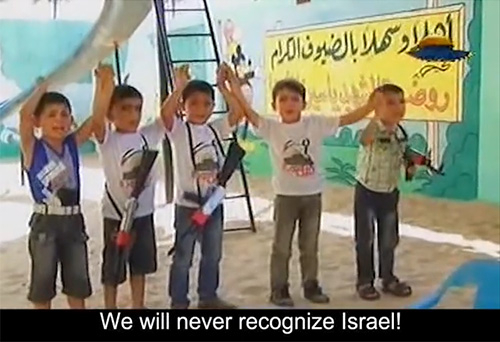 Hamas’s real problem with the UNRWA curriculum is that it could spoil the Islamist movement’s ongoing efforts to stir the hearts and minds of Palestinian children to wage jihad against the “enemies” of Islam. Hamas does not want Palestinian children to learn about civil rights heroes such as Mahatma Gandhi, Nelson Mandela, Martin Luther King and Rosa Parks. These people were opposed to violence and therefore their ideology, according to Hamas, is in violation of Palestinian and Islamic culture. Hamas wants Palestinian children to glorify suicide bombers and terrorists who mercilessly kill innocent people, including many Muslims, on a daily basis. Hamas’s summer camps are all about training children in the use of weapons and injecting them with more hatred towards Israel and the US. “Hamas is behaving in the Gaza Strip as if it were an independent state,” wrote Palestinian columnist Hassan Khader. Khader also criticized the Palestinian public and political factions for failing to pay enough attention to the controversy between Hamas and UNRWA over the school curriculum. For now, Hamas appears to have succeeded in preventing UNRWA from teaching Palestinian children about human rights. The two parties are now negotiating an end to the crisis, which does not seem likely unless UNRWA officially joins Hamas’s ideology and starts preaching for jihad and anti-semitism.